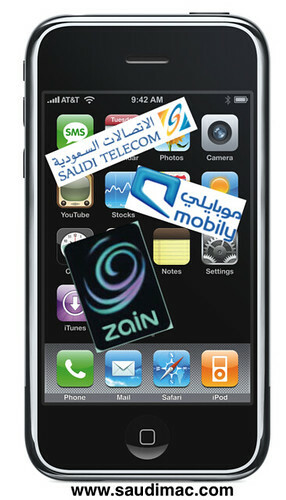 Only less than 2 days until the WWDC 2008 Keynote and none of the Saudi Arabia mobile operators (STC, Mobily and the new Zain) announced any deal with Apple regarding the release of the iPhone in Saudi Arabia. 1) Already in talks with one of those and nothing was announced until now. 2) Have no interest to officially release the iPhone in Saudi Arabia. 3) Going to release the iPhone unlocked directly to customers. Let’s hope its the latter. 1) Price: Apple is a US-based company and we hope to get a price based on the US Dollar. Assuming a base price of $400 that would be 1,500SR (Saudi Riyal) while the European price is 400 Euro which is equal to 2,368SR a huge difference in price that will effect the purchase. Also to note, Nokia devices cost less in Saudi Arabia than the European prices. 2) Arabic Support: Apple promised Arabic support for the iPods and Mac OS X two years ago. Only Mac OS X Arabic localization was release by Apple’s IMC. As for the current iPhone and iPod Touch. iPhoneIslam released an Arabic enabler application “Arabtaller”. Nokia is the number 1 phone in Saudi Arabia because they got the best Arabic support and we hope Apple would add that support as soon as possible. 3) Activation process: How will Apple handle the “activation process”? If it’s a “SIM locked” phone will the activation process be through iTunes or at the actual mobile telecom store? 4) App Store: Apple have not commented on any plans for an iTunes store in the Middle East. How will the iPhone and iPod Touch users access the App Store to download and install authorized applications and how can iPhone developers in Saudi Arabia sign up for the iPhone developer program? 5) Apple Service Centers: Apple only have 2 Service Providers and they are located in Riyadh only according to Apple IMC site. Compared to Nokia which have over 10 in Riyadh alone. And if you take an iPhone in, will they take 2 months to get a battery replacement in?. Let’s hope Apple do in fact release the iPhone in Saudi Arabia at the same time as the rest of the world. If it takes more than a few months to bring the iPhone in the market then just like the first generation iPhone, people will sell unsupported unlocked iPhones. not really, the iPhone sold by mobily is acceptable. Other phones are gray market anyway. why 2much expensive in saudi arabia?? i check apple website there only $99, $199, $299, exchange rate 3.75 so why different in saudi Arabia why SR 2499 like ?? No, the $99, $199, $299 prices are subsidized. AT&T is paying a part of the iPhone price so that you will stay with them for a 2 year contract. let me know price of iphone 3gs 8gb in saudi. i bought my iphone one of my friend, the problem is when i charge it for about two hours and its fully charged, when i used it and open applications suddenly there is pop window say 20% left or it low battery… what i do? is this need to change the battery? most likely, is it from Mobily ? i dunno where my friend bought it… can help me pls what will ido? what shops in riyadh that authorize to repair iphone? where is that ? can u pls tell me where is that in riyadh? However, I use my iPhone for business all day long and it simply won’t last (reminds me of my first mobile 20 years ago! ), so i have now fitted a sleek Mophie slip-on case, which has a battery in it and can provide a extra two full charges (approx). I never need to take the case off, as it comes with a USB charger cable. Makes the phone slightly chunkier, but it still slips into my jeans pocket. I suspect there are other similar devices available, but this one was recommended by my regular salesman at the Apple store in the Westfield Shopping Centre. I want to purchase an I Phone5,where can I avail it in Jeddah? How much is it?